We become involved in our local school, sporting club or scout group invariably because one of our children had entered that environment and we wanted to make a difference. We wanted to ensure that we contributed intellectually or resource-wise and added to the quality of the experience and to the quality of his time there and well into the future. We become involved because we had a vision of what could be achieved. This was based on the inefficiencies or failures of “the system” when we experienced that as children or young adults ourselves. Naively, we also believed that every individual shared these values. This was not always the case. The roots of MDA can be traced back to the mid 1970’s, initially functioning as a small not-for-profit agency. In June 1984 it reached formal status when it was officially certified as the Muscular Dystrophy Association of Victoria (MDAV). This was just several months from that time when my son Ryan was diagnosed to be affected by Duchenne Muscular Dystrophy. 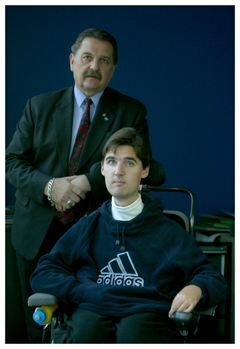 My son has been the catalyst for the growth and achievement of MDA. I recall my first day on the job as a volunteer, walking into a small office in Ascot Vale, a suburb of Melbourne where we had just taken out a six year lease. The enormity of the task ahead quickly struck me when all I could find for a chair was an old orange crate. We have come a long way since then, building a team of dedicated staff and volunteers who can be proud of the achievements we have made in recent years. Today we are providing many valuable services to thousands of Australians and we are also rapidly forging strong relationships with people overseas; scientists. clinicians and members of the international MD community. We are not an organisation that believes in geographic boundaries and are very happy to provide an outreach service to people who need our help and advice, wherever they may live. Recognising the likelihood of early research advances, the MDAV had the vision to ensure the future availability of research funds and as a consequence, established the Muscular Dystrophy Research Foundation in 1985, two years before scientists isolated the Dystrophin gene. This great discovery offered enormous potential for advances in MD treatment. Together with Professor Ed Byrne and Dr Lawrie Austin, we set about the significant task of establishing a dedicated MD research facility. On 9th December 1993 the Minister for Health, The Hon. Marie Tehan and Ryan, officiated at the opening of the Melbourne Neuromuscular Research Centre. Shortly after, the Centre attained Institute status and became the Melbourne Neuromuscular Research Institute (MNRI). This was achieved in collaboration with St.Vincent’s Hospital and the Department of Medicine, University of Melbourne. In keeping with the significant evolution of the MDAV, on the 2nd April 1996 the Association’s name was changed to Muscular Dystrophy Association Inc (MDA). The MDA has a very strong commitment to “quality-of-life” programs, and developed the CampMDA program in 1988. National CampMDA has attracted participants from every State and Territory in Australia including campers from overseas. To date over 1,100 tertiary education students have been trained at CampMDA with the delivery by MDA of over 125,333 hours of Education & Training and over 158,000 program hours have been delivered, resulting in the provision of 335,954 hours of respite. In January 2007 the 66th National Camp MDA was held for children and adults with a neuromuscular disorder. The MDA also runs extensive information programs with world-wide links to research centers and MDA’s around the globe. This information is available at our MD Centre or from our web site The Home of MDA – the first official website in the world dedicated to MD. We have received over 15 million visitors to The Home of MDA since inception. With the creation of the new Muscular Dystrophy Australia entity, the MDA embarked on rebranding the organisation with a new logo. The MDA logo comprises three elements. The first impression is that of a styalised individual. When you look further it soon becomes obvious that the shape of the “arms and legs” look very similar to a medical representation of muscle. Finally, the double strand of the “arms and legs” represents the double helix of DNA. Almost 10 years to the day that the Melbourne Neuromuscular Research Institute (MNRI) was officially opened it undertook another significant metamorphosis. Following extensive discussions, strategy meetings, planning and finally execution, the MNRI took on a new life as the National Muscular Dystrophy Research Centre. The original partners comprising the MNRI were St.Vincent’s Hospital, The University of Melbourne and the MDA. This relationship has endured and provided a solid platform from which the MNRI was nurtured and was able to grow to an Institute providing a considerable level of scientific contribution to the international quest for a timely solution. The MDA and St.Vincent’s Hospital retain their strong support and sponsorship of the National Muscular Dystrophy Research Centre with a new major partner – The Howard Florey Institute (HFI). The NMDRC is now a wholly owned subsidiary of HFI, which for the past several years has worked toward being the preeminent Neuroscience Institute in Australia. With the move of several large research teams with significant interests in Neuroscience to The HFI, critical mass has certainly been achieved. The synergies between HFI, the NMDRC and the MDA have been further reinforced with my appointment to the Board of the Howard Florey Institute. In keeping with a “borderless philosophy” of caring for an individual or family, no matter where they were living, on the 24th November 2006, we adopted a new name for the fight ahead – Muscular Dystrophy Limited or Muscular Dystrophy for short. Today we operate under this broad umbrella. When we receive calls for support from geographic areas distant from our Melbourne offices, we are able to fulfill these requests seamlessly. This assistance is met with appreciation by families and individuals. Given the feedback we receive, we know we are on the right track with extending our vision to what can be achieved when a little bit of effort, empathy and understanding is freely and efficiently provided. We have come a long way since the embryonic “orange crate days” of the Muscular Dystrophy Association of Victoria, to an organisation delivering hundreds of thousands of hours of support, nationally whilst striving to provide best practice, despite whatever parochialism that might exist today – Muscular Dystrophy – Sans Frontières!